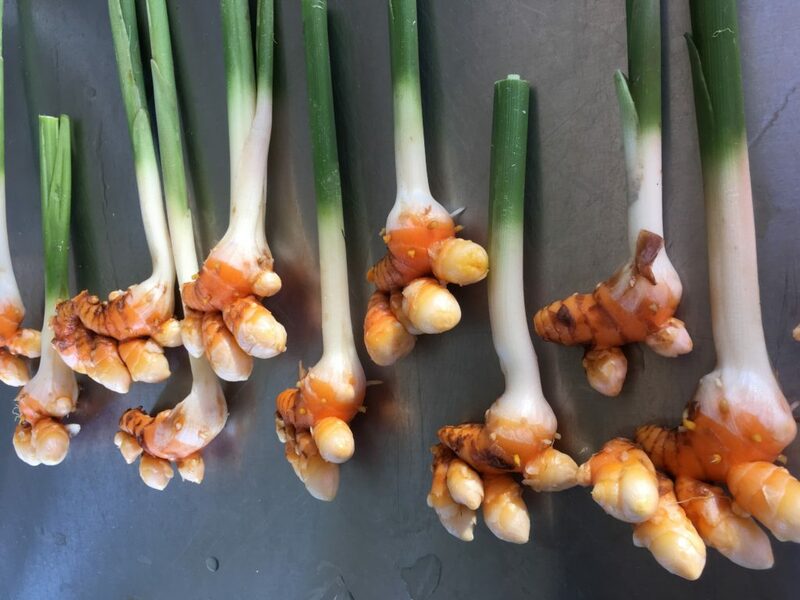 We ordered our turmeric and ginger seed pieces from a farm based in Hawaii. The local seed sources and the sources from Hawaii tend to sell out quickly. 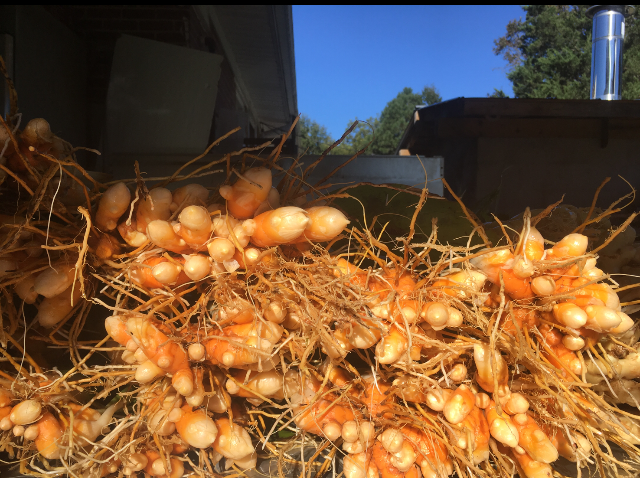 Now is the time to buy seed pieces if you would like to grow your own turmeric and ginger next season. 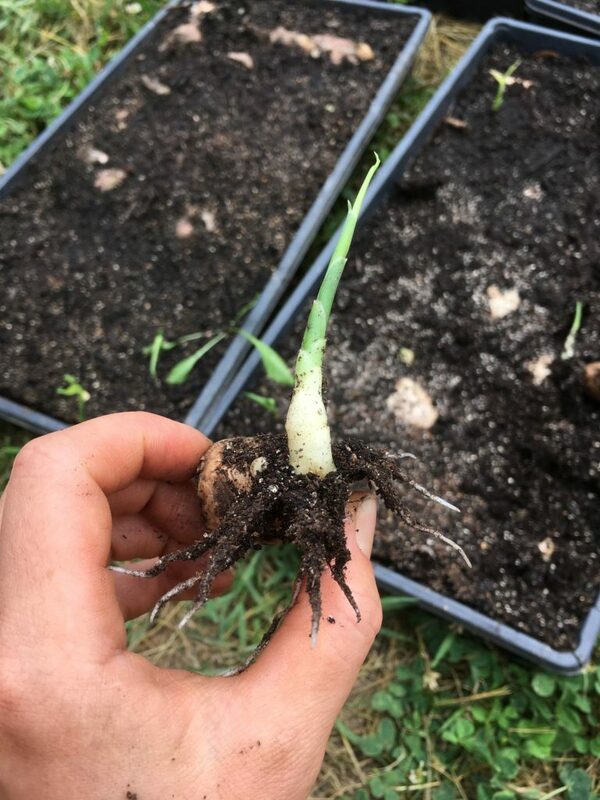 We pre-sprouted our seed pieces in the greenhouse to get the root and shoot buds to start growing and extend the season before planting them in the ground (see photo above and below). When pre-sprouting be sure to disinfect your seed pieces beforehand if needed. 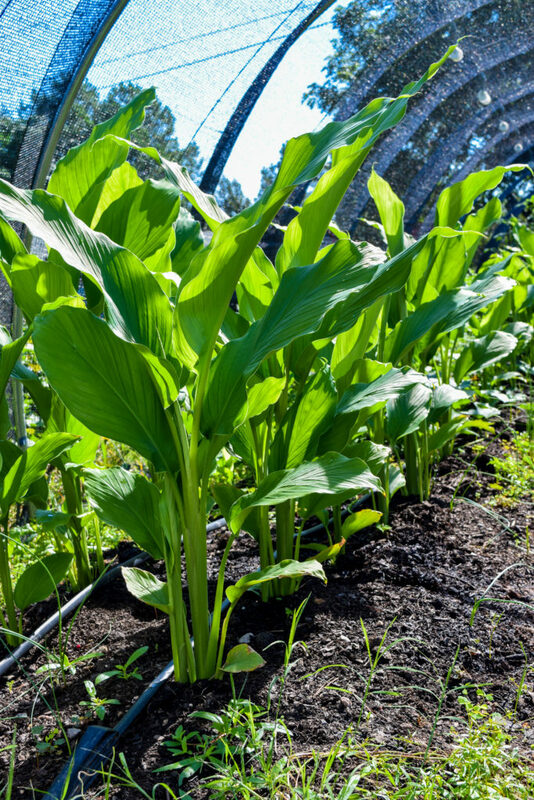 Do not over-water them once planted in a pre-sprouting tray; this can lead to the ginger staying dormant. Our ginger did not pre-sprout as well as we were hoping this first time around, but our turmeric did great! 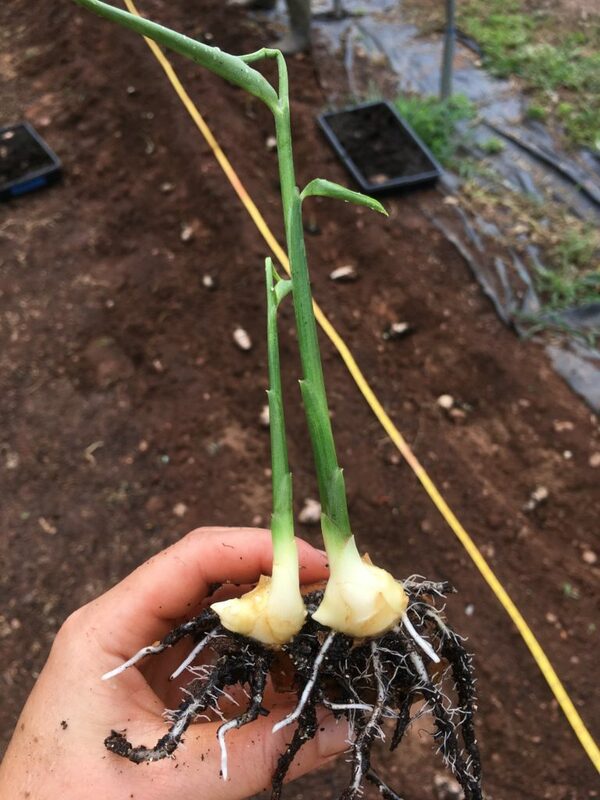 After 4-6 weeks, we took our trays of pre-sprouted turmeric and ginger and planted them out in our caterpillar tunnel, 4 inches deep and 6 inches apart (see photo below). 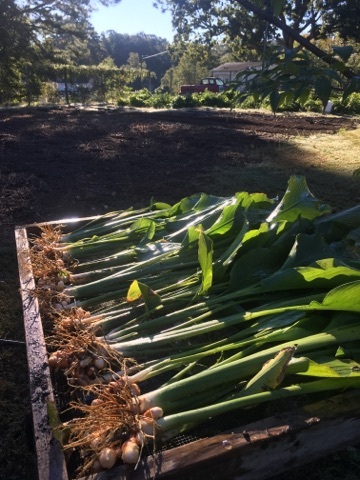 We hilled our turmeric and ginger plants twice throughout the season with a decomposed leaf mulch to help increase yields. We replaced our caterpillar tunnel plastic with a shade cloth once summer started heating up. 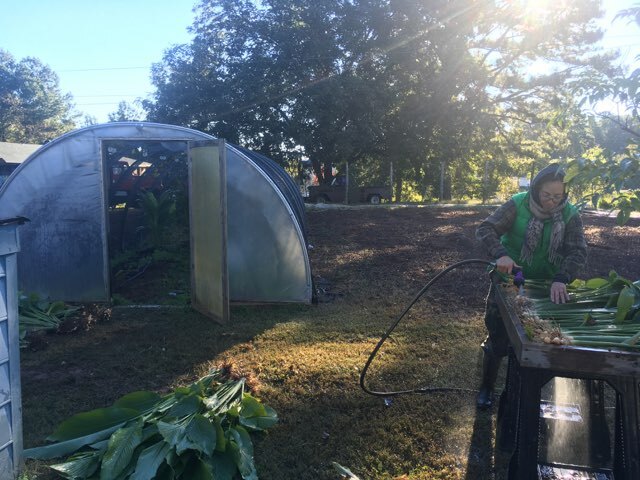 In the photo above you can see our turmeric plants growing under the shade cloth. 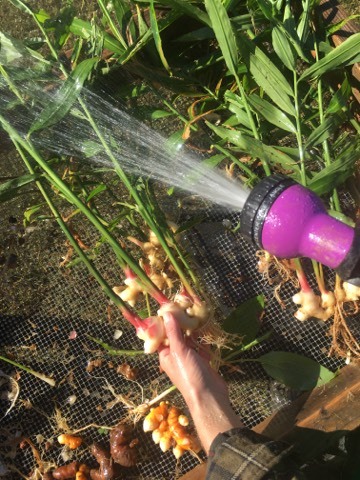 About 5 months after planting the pre-sprouted seed pieces, we harvested the ginger and turmeric for baby ginger and baby turmeric. Baby ginger has no skin to peel and no fibers, but also stores for less time. 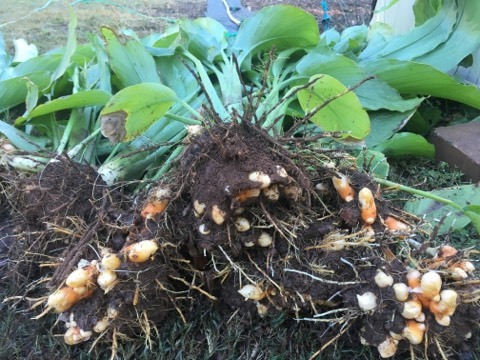 Above is a photo of our turmeric right after harvesting them with a digging fork. 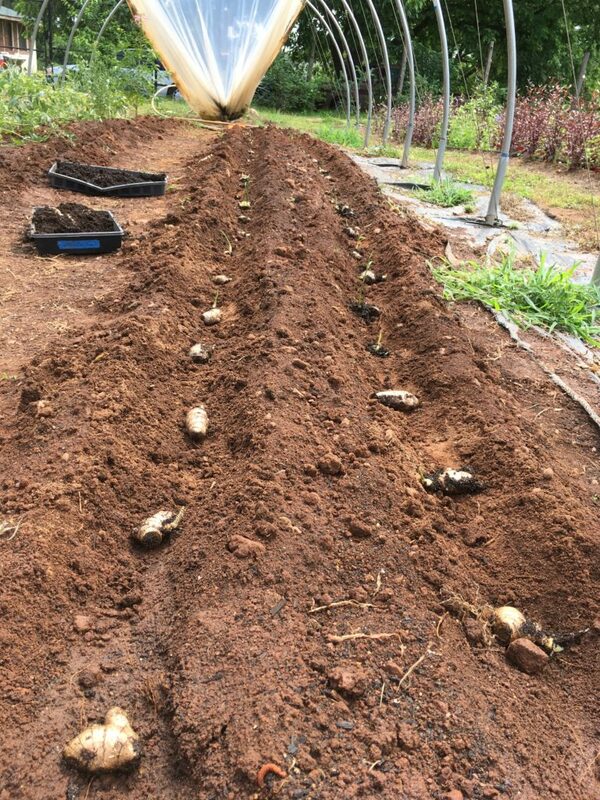 We tried to get off as much soil as possible and then sprayed them clean (see the three photos below). Above is a photo of our clean baby ginger. The above two photos show baby turmeric after cleaning and throughout the processing. 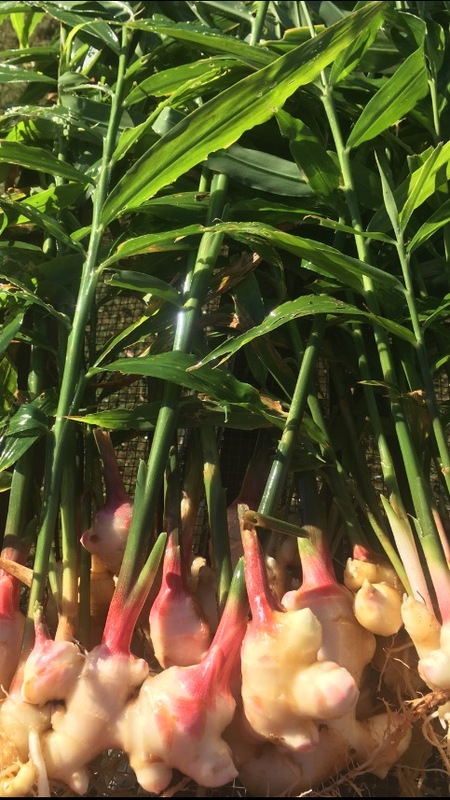 It was really fun to grow turmeric and ginger and we look forward to next season’s crop!